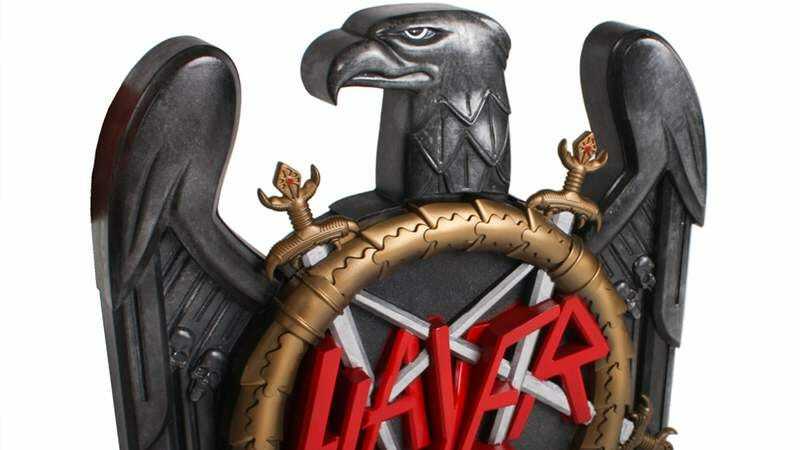 Slayer‘s new album, Repentless, is set to be released on September 11. And, presumably in order to ensure that fans will never forget that they bought it, the band is releasing Repentless in a special “Metal Eagle Edition.” That’s a literal metal eagle, made of aluminum alloy and emblazoned with the band’s signature upside-down pentagram logo. The special edition costs $179.99, measures 15 inches wide by 17 inches tall and 3 inches thick, and, at 7.8 pounds, weighs as much as an estimated 168.47 human souls. Besides a CD copy of Repentless, the hollowed-out insides of the majestic bird will contain a bonus Blu-ray and DVD (Slayer Live At Wacken 2014 and a documentary on the making of Repentless), a bonus CD (Slayer Live At Wacken 2014), a poster, sticker, and numbered certificate of (we assume) awesomeness. As far as we can figure, the weighty fowl came to exist one of two ways: Either it was a hilarious mistranslation of the phrase “heavy metal album” that must have given Kerry King and friends quite a laugh when a crate of the things arrived from the factory, or it was deliberately designed to be heavy enough to bludgeon someone to death with a Slayer album. Regardless of whether you’re planning to commit aggravated assault with the thing, only 3,000 of the special Metal Eagle Edition birds will made, so if you want one, you should probably pre-order it on the Nuclear Blast website.